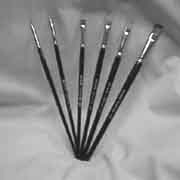 Browsing Category: Brushes Displaying 1-9 of 9 Found. $3.00 A must for putting on that tramp beard! $3.00 he perfect puff to use with the new setting powders.